Millions of pieces of original content were used by the site without consent, rewardStyle contends. Now this is some real millennial news right here, but it’s serious business nonetheless. PopSugar, a website I’m most often redirected to when I click a celebrity fitness-related links on Pinterest, has been accused of obtaining millions of pieces of content from influencers affiliated with rewardStyle, the Dallas-based fashion technology startup that helps influencers worldwide monetize their blog posts, without the company’s or the influencers’ consent. 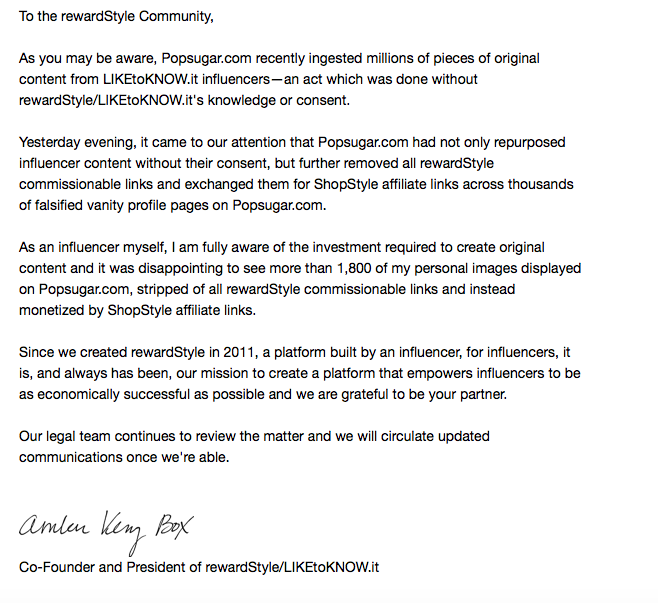 Then, according to a release from rewardStyle, PopSugar stripped the content of all commissionable rewardStyle links, replacing them with digital shopping platform ShopStyle‘s affiliate links, ensuring that neither rewardStyle nor the influencer receives any money if someone buys the product they’re marketing. Though the PopSugar page featuring the influencer content was taken down (it’s unclear how long it was up in the first place) after bloggers flooded the comment section of PopSugar’s Instagram account (oof), Lage took a screenshot of what her content (under the name @ayanagabriellelage) had looked like on the site below. Laura Adney, a mother and founder of the Have Need Want blog, found out she had 431 pieces of content stolen after seeing the Facebook group post, and was most appalled to see images of her son used. “The use of my child to sell product on websites; as a mom that’s upsetting,” says Adney. For the influencers, it’s an issue of copyright infringement as much as it is the lost commission. Most bloggers’ bigger paychecks come from the deals they make with brands allowing them to use their images and content. 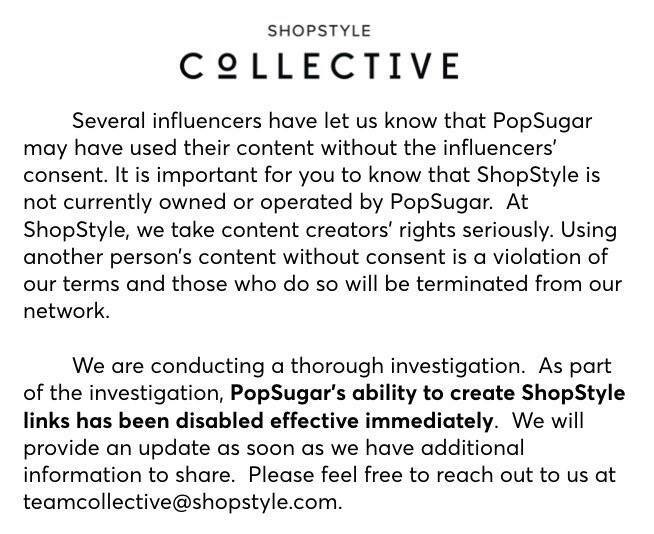 ShopStyle also released a statement explaining that (though they were created by PopSugar, the shopping search engine was sold to Ebates in 2013) they are not owned or operated by the company, and have disabled PopSugar’s ability to create links today. Some influencers have already made plans to take legal action. “I honestly have no idea what happens next. It’s all uncharted territory,” says Adney. D Magazine has reached out to both PopSugar and ShopStyle for a statement. *UPDATE: PopSugar CEO and Founder has released an apology on Twitter, saying they will “pay in full” the influencers who earned up to $2,695 in commissions on PopSugar.com.